The HIDE-IT holster is the ULTIMATE in DEEP CONCEALMENT. 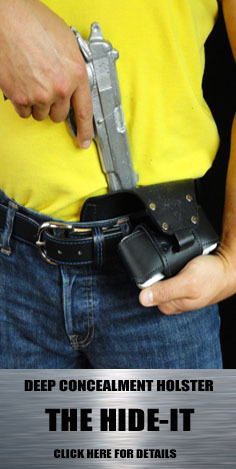 The HIDE-IT is a UNIVERSAL holster and can carry over 500 DIFFERENT pistols. The Hide-It can attach to a Cell Phone case (as pictured here). The Hide-It comes in BLACK, RIGHT or LEFT handed. Unlike a traditional IWB holster, the HIDE-IT rests BELOW your bend point allowing you to sit comfortably. You will NEVER have to buy another holster again! * The BEST explanation of how the HIDE-IT holster works can be found in our Hide-It Video found above. * The HIDE-IT holster doesn't require you to dress around the pistol, NO more untucked shirts and jackets. Carry any gun you want, anytime. As long as you have pants or shorts on you can operate the HIDE-IT holster. * The Inner part of the holster conforms to your pistol. The outer part of the holster is curved to the shape of your thigh eliminating the outline of the pistol. * The cell phone case attaches to the HIDE-IT holster and clips over the top of your pants to keep the holster from falling down. * The only guns the HIDE-IT holster cannot accommodate are mid-full size guns with scopes,K frame or larger revolvers. * The Hide-It Holster will accommodate handguns with Crimson Trace Lasers! WHAT SIZE CELL PHONE CASE DO I NEED? Remember that your phone must be smaller than the case to fit. Pick a cell phone case that is slightly larger than your phone. Medium #4 4-3/4" 2.75" 1.125"
Large #5 4-7/8" 2.75" 1.125"
xLg #6 5-1/8" 2.75" 1.125"
2xLg #7 5-5/8" 3.0" 1.125"
3xLg #8 6.25 3.0" 1.25"
4xLg #9 6-5/8" 3.5" 1.25"
5xLg #10 7" 3.5" 1.25"
IS THE HIDE-IT HOLSTER COMFORTABLE? * YES! VERY! You will be pleasantly surprised! * The HIDE-IT allows the pistol to rest behind your pocket and BELOW YOUR BEND POINT so when you SIT, it lays on your lap. * The problem with all other holsters on the market is they put the un-bendable object, the gun, in the bend point. * Don't believe us, try it! We offer a 14 day money back guarantee on all of our products!